This historic home in Ladue has been extensively remodeled into a spacious and elegant New England-inspired home with modern, energy-efficient features. 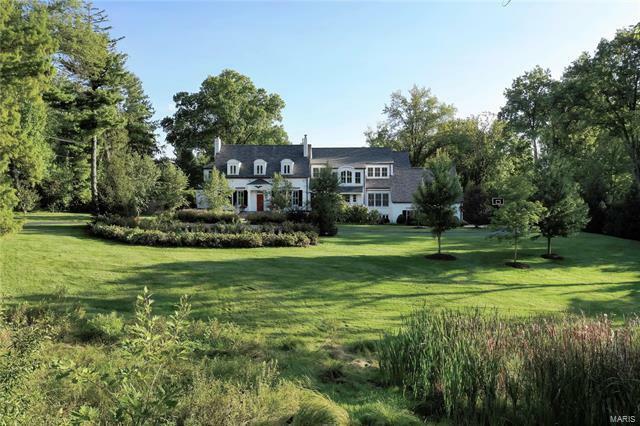 A winding driveway leads through almost three acres of park-like landscaping to the home sitting back 360 feet from Ladue Road. A gracious entry hall opens to the living room with fireplace, the dining room with adjacent marbled butler's pantry, and library with cherry wood book cases and paneling. The home is light-filled, with ample windows bringing the outdoors inside, and 9’6” ceilings throughout. The airy Master Bedroom and sitting room overlook the sweeping lawn and pool setting. The Lower Level has a Media Room, a dedicated workout room, and a Rec Room with wet bar. The home has a geothermal heating and cooling system, a roomy second-floor laundry room and an artist's studio with skylights. A remarkable family home filled with charm, elegant features and practical assets.